A few weeks ago, I tried the corn chowder from Panera Bread while out to lunch. I don't think I've ever had corn chowder before and it was delicious. A perfect soup for summertime. I instantly wanted to create my own recipe to enjoy at home. Since it's already extremely hot here in FL, I waited for a rainy day to try it out. Last week Tropical Storm Colin brought some full days of rain. 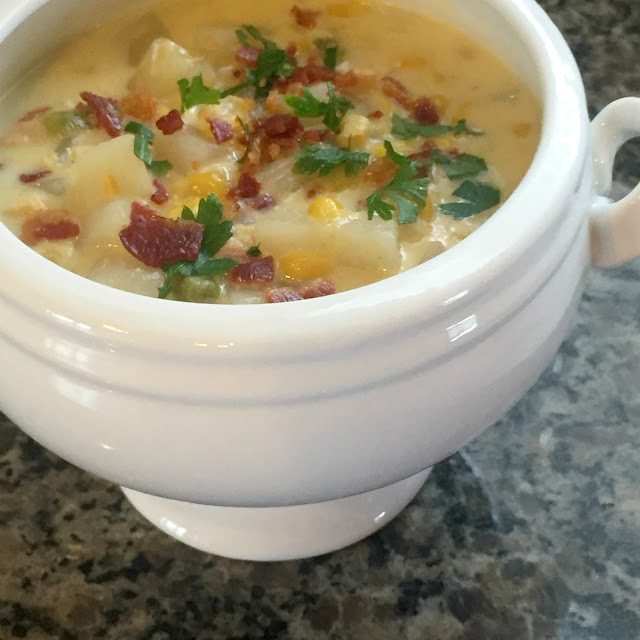 I knew this chowder would be the perfect comfort food for those rainy days. I made sure to have all of the ingredients on hand and chose the rainiest day to make it. The entire meal took about 45 minutes to make. While I don't LOVE spending more than 30 minutes on dinner, there was only about 20-25 minutes of hands on time with this one. 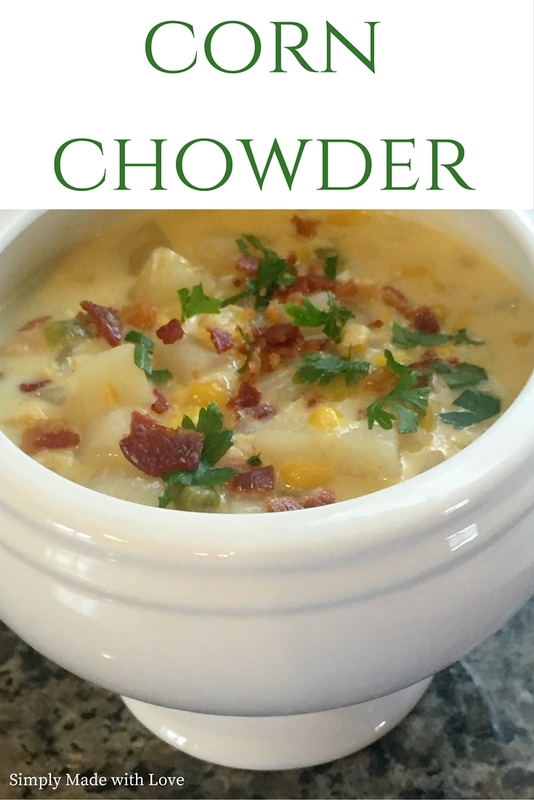 The chowder was full of flavor, perfect for a cold or rainy day. Hubs likes an extra kick in his, so he added a bit of hot sauce to his. This recipe serves 6-8 people, so I brought a big container to our neighbors to enjoy as well. 1. Cook bacon in a skillet over medium high heat. Once crisp, chop. Reserve 2 tbs of the bacon drippings and 1 tbs of the chopped bacon. Set aside. 2. Peel & chop potatoes. In a large pot, add the reserved bacon drippings, potatoes, onion and pepper. Cook for 5 minutes over medium high heat. 3. Pour in chicken broth and all of the corn. Stir. 4. Season with salt, pepper and nutmeg. 5. Bring mixture to a boil. Once boiling, reduce heat to low and cover. 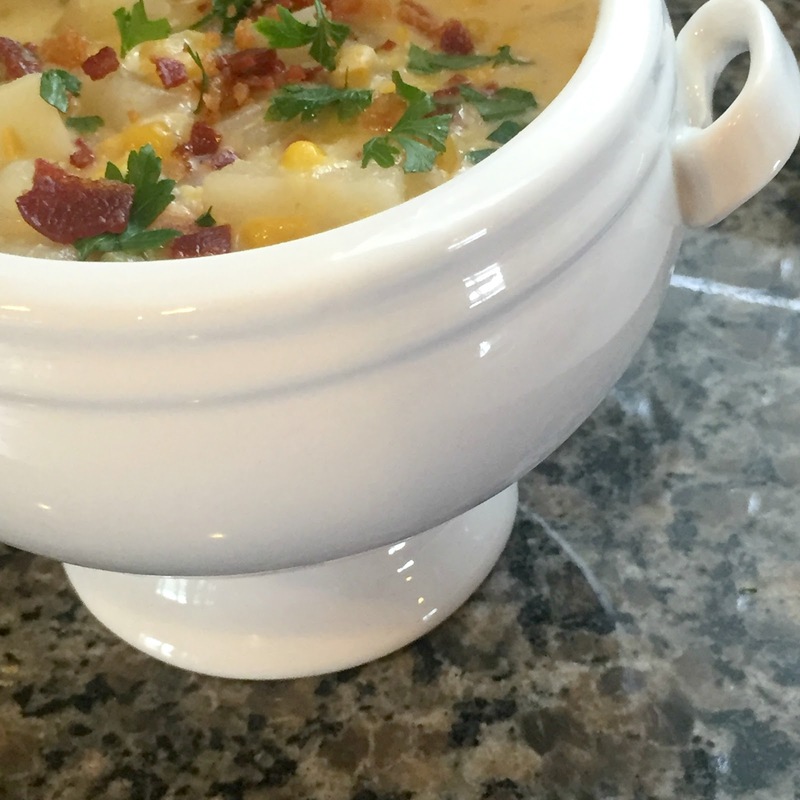 Let the chowder simmer for 20-25 minutes or until potatoes are cooked & tender. 6. Once potatoes are tender, warm half & half in a small saucepan just until it bubbles. As soon as it's bubbling, remove from heat and add to chowder. Stir well. 7. Serve with fresh parsley and the remaining bacon. Something I love to do is give gifts. I love making others happy and letting those closest to me know I'm thinking about them. Recently, I had a close friend who had been on my mind day in and out. She had been going through a tough time and I wished over and over I lived closer to be able to bring her a cup of coffee and some sweet treats. And a big hug too! 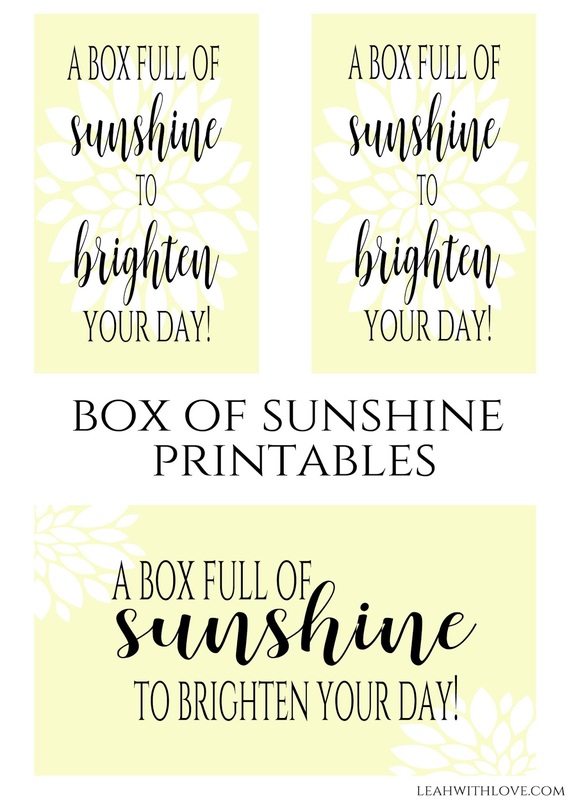 I decided that even though I wasn't close enough to hand deliver something, I could do the next best thing and send a thinking of you gift. 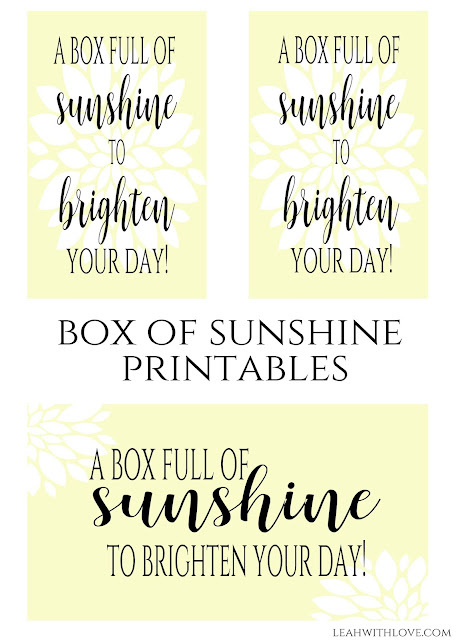 I've seen these sweet boxes of sunshine on Pinterest and decided that would make the perfect gift. A bright and colorful gift to bring a smile to her face and let her know I was thinking of her. While I was out and about at Target and the grocery store, I picked up all things yellow. Everything that I could find that I thought would ship well and bring a little joy. After I did my shopping, I put everything in a box and made a printable to go with the gift. I packaged everything up and sent the love on it's way. 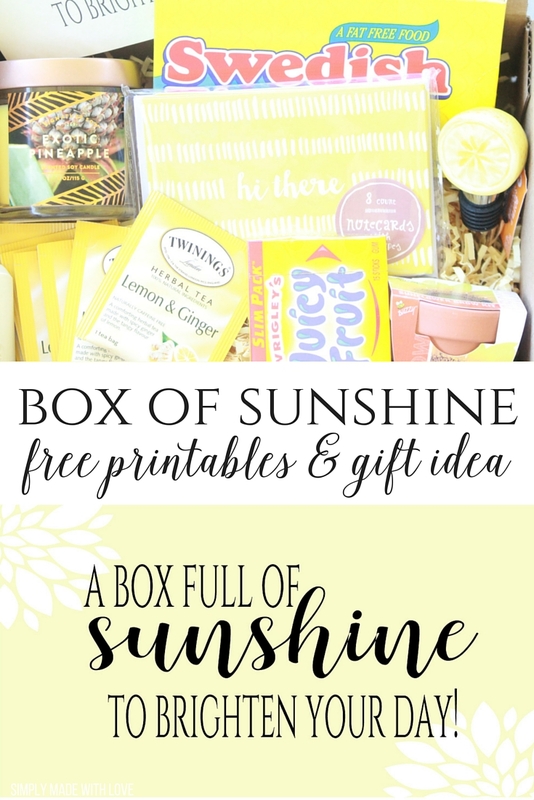 Below you'll find the free printable along with the items I included in the box along with some more ideas of things you could include. Enjoy!